I love my engagement ring. A dear friend, Maressa of Mari Tome made it for us. It to looks like an antique. 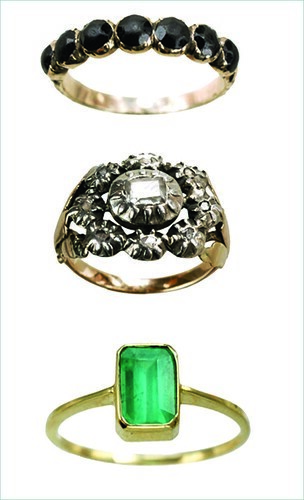 If I had more room on my ring fingers I’d love to don any of these true antique gems (no pun intended) from one of my favorite jewelry shops, Erie Basin. Free father’s day card for you to grab! sigh…to have more fingers on each hand…. ooh, i love those! i’ve been meaning to go by that place! it’s well worth it Caroline. Red Hook is a trek but there are some cute places to visit while there like Saipua and The Good Fork. The clarity of that emerald is amazing. Great find, thank for sharing this. yes that emerald one is so simple and yet so beautiful.